Thebes City was located in the east side of the Nile around 800 km from the south of the Mediterranean Sea. It was known as Waset to the ancients. To have a look at the ruins of Thebes, you have to pay a visit to modern Luxor by a majestic Nile cruise. Thebes was the main capital of Egypt during the middle & the New Kingdoms of ancient Egypt. It was rich with different mineral resources and it had a strategic location between Nubia and the eastern desert. The site of Thebes includes many terrific attractions of Luxor including Karnak & Luxor Temples. This city was built on the alluvial plains of the Nile Valley, which follows a great bend of the Nile. There were about 40,000 inhabitants in 2000 BC in Thebes. And by 1800 BC, the population in Thebes became 30,000 people, which made it the largest city in ancient Egypt. There were many festivals that were held in Thebes such as the beautiful Feast of Opet, the Khoiak Festival, Festival of Shemu I, Festival of Shemu II. There were also the Halloween festivals like Beautiful the Valley Festival. 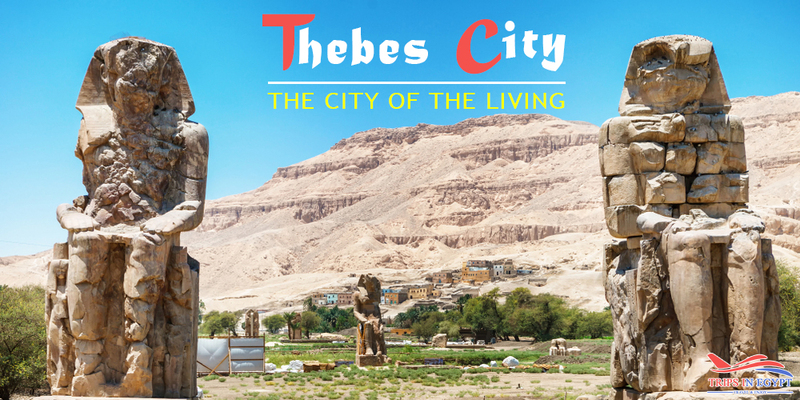 People lived in Thebes city from 3200 BC. Thebes city was once the capital of Waset and it was a small trading center while Fustat was the large capital of ancient Egypt. A few constructions have survived during Egypt Old Kingdom including Karnak Temple from Egypt Middle Kingdom, part of the 5th dynasty pharaoh, Nyuserre, and a statue of the 12th dynasty pharaoh Senusret. The eleventh dynasty ruled part of Upper Egypt and they took Thebes city as their headquarters. Intef was probably the first in his family to reach a partial pharaonic titulary. Although he was, a great king but his power didn’t extend much away from Thebes. In 2050 BC, Mentohotep II, the son of Intef III, was able to reunite Egypt again. He ruled for about 51 years and he built the first mortuary temple at Deir el-Bahri. The Thebes city continued its rule as a religious center during the 12th dynasty. Hyksos moved to Egypt in the 15th century and started their attempt to take Memphis. The Thebans stood over their immediate region and resisted Hyksos from moving further in the country by asking them to sign a peace treaty. Ahmose I was able to capture the capital of Hyksos, Avaris and got them out of Egypt. Ahmose I took the Thebes city to be his capital to unify Egypt during the 18th dynasty. Thebes in that time became an important center of civil service. Religion flourished so much in Thebes that Amenhotep III used his wealth to build temples of Amon and that is why god Amun became a principal state deity. Then Thutmose I started the construction of Karnak Temple in addition to the renewal construction activities by Queen Hatshepsut. During the reign of the 18th dynasty, Thebes flourished a lot and many temples and tombs had been built by Amenhotep III, who built a large mortuary temple and made huge achievements to his country. He also built Luxor Temple and constructed the Sphinxes that lead to Karnak. Thebes city faced its dark age under the reign of Akhenaton who abandoned the worship of god Amun and closed all temples related to that god. He encouraged his people to worship god Aten. The seat of government moved during the 19th dynasty from Thebes to Delta. Thebes got its importance again during the reign of Seti I & Ramesses II. Thebes started to decline when there were some economic problems during the reign of Ramesses IX. Taharqa abandoned Lower Egypt and fled to Thebes after being attacked from the Assyrian King Ashurbanipal’s army in 667 BC. The relationship between the Thebans and the power in the north ended when the Egyptian pharaohs were replaced with the Greeks. Although Thebes became part of the Roman province of Thebais, the city continued to decline. The Great Temple of Amun at Karnak, Luxor Temple, Khonsu Temple, Precinct of Mut, Precinct of Montu, The Village of Deir El-Medina, Ramesseum, Valley of the Kings, Valley of the Queens, Valley of the Nobles, Queen Hatshepsut Temple, Ramesses III, Amenhotep III, and Seti I. Finally, we offer a variety of Egypt tour packages to stunning destinations in Egypt such as Cairo, Luxor, Aswan, Alexandria, Hurghada, and Sharm El Sheikh.